Georgia's President Saakashvili has officially signed a ceasefire agreement, together with Abkhazia, South Ossetia and Russia. Georgia's request to replace Russian troops with EU or UN troops in the occupied areas was, predictably, dismissed. Whilst it appears as though the areas of Georgia that are not within the disputed separatist enclaves will remain entirely within the control of the Georgian government, it is not yet clear what will happen in the days that follow. Will Russia withdraw from areas such as Gori, outside of the disputed territory of South Ossetia? 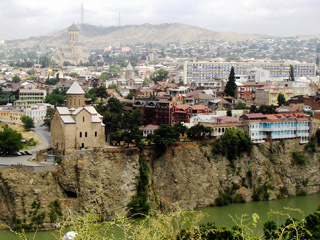 What will happen with the forces that are reported to have mobilised less than 40 miles from Tbilisi itself? In short, the next phase in this may be as dangerous as the last week, leaving a broken country in a state of chaos. The US has not agreed to offer, as Saakashvili had initially put out to the international press, to take control of ports and airports in Georgia. The US's offer of humanitarian aid makes it clear that they do not wish to become enmeshed in this confrontation between Moscow and its former satellites beyond the level of strong rebukes and diplomacy. This means anything could happen next, and in all likelihood, Saakashvili will pay the price for the events of the past week. The international community will now be focused on the mistakes of the Georgian leadership,and a period of chaos and lawlessness is highly likely. The Russian troops, a conscript army, despite being well equipped, are not professional or disciplined. The atrocities committed against civilian populations are proof of this. Moscow cares as little about the South Ossetians as it does the Georgians it is bombing, regarding the territory as a pawn in its bid to bring Georgia and its neighbours back into its sphere of influence. It was as recently as 4 August that Russian foreign minister Sergei Lavrov - a relative moderate within the Moscow leadership - had said: "We will do everything possible to prevent the accession of Ukraine and Georgia to Nato." The ordinary citizens of South Ossetia could feel little confidence either in the government of Eduard Kokoity, which has a reputation for allowing criminality and has engaged in provocative statements and actions towards Tbilisi over much of this summer. It is likely that the de facto authorities in Tskhinvali would long ago have lost power had they not been the rallying-point against Georgia. Russia is not and has never been an honest broker in this region -- that would run contrary to its understanding of its own purpose as a global power. In many ways Putin has a messianic streak, and has been quoted as saying that the collapse of the USSR was one of the worst events of the 20th century. Russia has cynically used international human rights terminology such as "genocide" to describe events in South Ossetia, knowing full well that this was simply part of its media strategy, the terms used as a cruel mockery symptomatic of the contempt they hold for our values. It is part of the Transatlantic Institute's mandate to draw attention to matters of international relations that we believe would be of public concern if the facts were more widely known or understood. If there is one message from Russia's war on Georgia, it is this: no matter how difficult or distasteful, Western states can no longer pretend that Russia is capable of operating as a civilised nation. She cannot and should not be within the G8, and World Trade Organisation membership is out of the question. Whatever inconvenience this may cause, Russia cannot continue to strut with nations whose values she does not share. There are clear guidelines for membership of these organisations, and Russia has made no effort to remain a member in good standing. Russia believes neither that her actions in Georgia will result in such censure, nor that we have the courage of our convictions, especially given the tight energy market. Maybe it is time for Russia to experience a nasty surprise.